I've got another prize pack to give away to a Theme Park Insider community member. 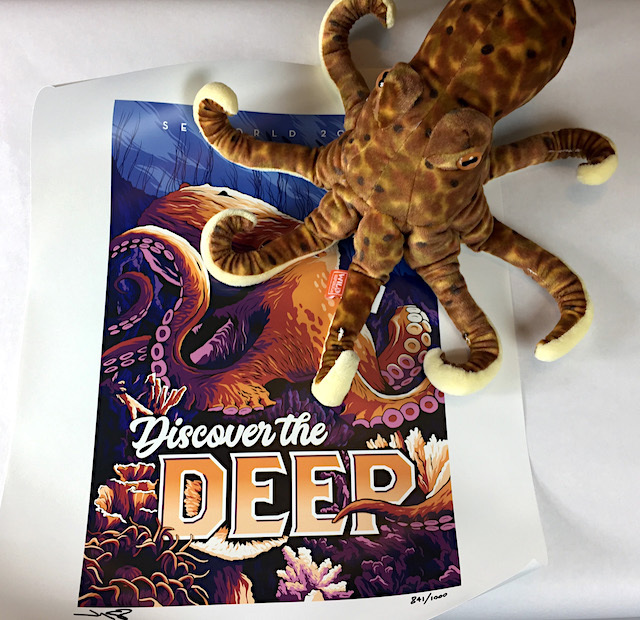 This one comes from SeaWorld and includes a signed art print and a plush toy. Log in and respond to this post! One entry per person per prize pack, and you must be 18 years or older and have a mailing address in the United States. I will select an eligible entry at random, then email the prospective winner to confirm their delivery address. Contest closes one week after this post went live. Thank you for reading Theme Park Insider and for being part of this community! We love Sea World, and have a little guy on the way! We can’t wait to take him and ignite his curiosity and love for animals and the ocean. It looks a little scary. I'm in for this! All 3 Sea World parks are dear to my heart! Have a stuffed Shamu from Sea World, and can envision great octopus-orca battles in our household. Thanks for another fun giveaway, Robert! Ready for exploration of the deep! My oldest boy goes everywhere with his shark hat he got at SeaWorld. He is always getting comments about it. Been a long time since we've been to SeaWorld, but this might spark a future trip! Thanks! SeaWorld San Diego FTW! Count me in! My family went, sheepishly, to Sea World last year as an add-on to a Legoland vacation. I say sheepishly because we had heard the bad press surrounding Blackfish. I have to say, though, that the park completely won us over. The animals seemed well cared for, and we had a truly excellent time. Sea World is underrated. An octopus AND a matching print? I'm in! Congratulations to our winner, Manny Barron!